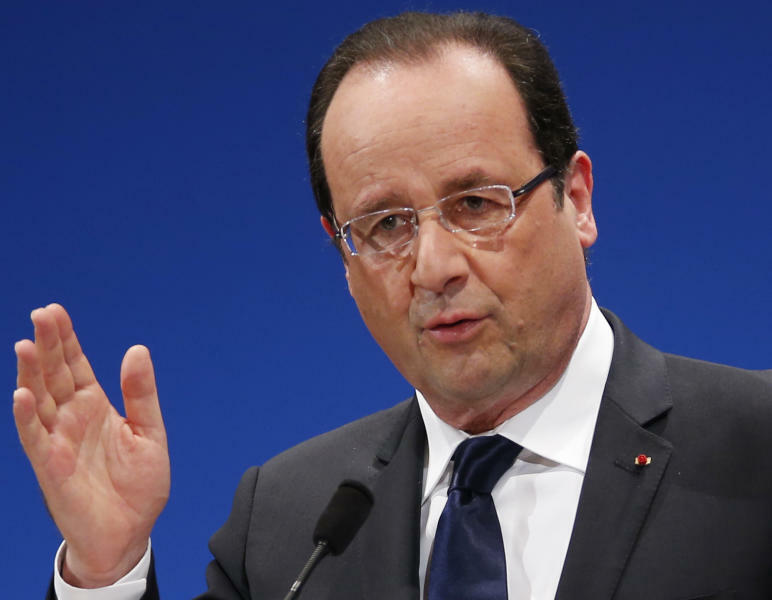 TOKYO (AP) — French President Francois Hollande sought reassure Japanese business leaders Saturday that the eurozone debt crisis is over but acknowledged that steps to boost the region's growth and competitiveness need to be taken. 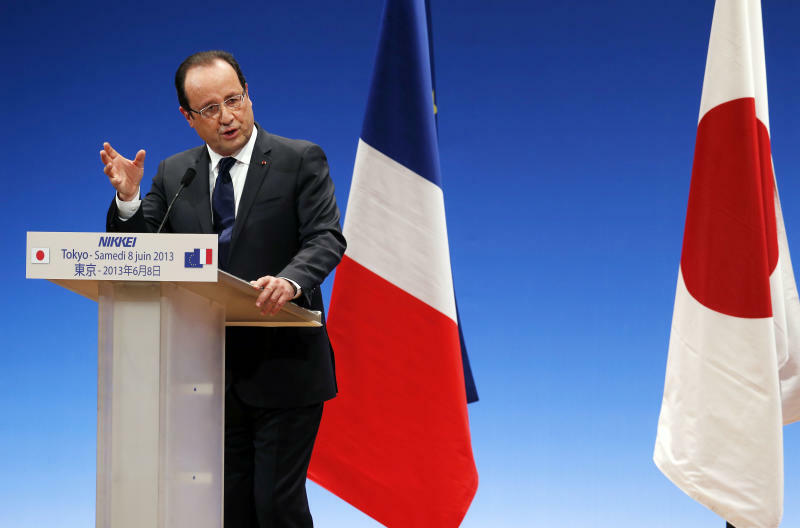 In a speech on the final day of his visit to Japan, Hollande said that the potentially destructive debt crisis has served to "reinforce" Europe and foster greater integration of the 17 member economies that use the euro currency. He said authorities are developing tools to ensure greater stability and solidarity such as a Europe-wide "banking union" and budgetary rules. "What you need to understand here in Japan is that the crisis in Europe is over. And that we can work together, France and Japan, to open new doors for economic progress," he said in the speech at the Imperial Hotel organized by The Nikkei, a major financial newspaper. Although the eurozone debt crisis that erupted at the end of 2009 has eased, the region's collective economy has shrunk for six straight quarters and unemployment has reached 12.2 percent, the highest since the euro was introduced in 1999. Hollande said Europe needs to put more emphasis on taking steps to promote growth and competitiveness "so that we can have a better presence in the world." He also highlighted his proposal to create a common economic government for the eurozone that would set economic policy. 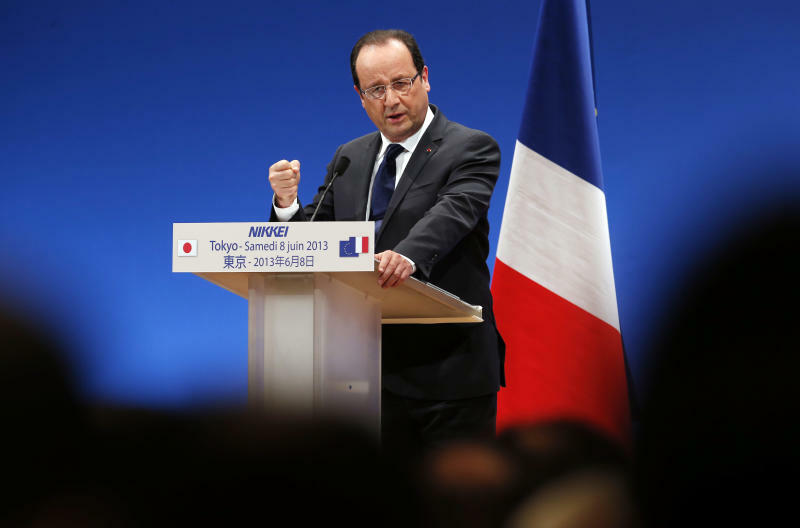 Hollande called Japan an "exceptional partner" and urged both countries to invest more in each other. France's annual exports to Japan total about 7.5 billion euros ($9.8 billion), while its imports are just over 9 billion euros. Both rank 11th as respective trade partners. He said some people may have the impression that France and Japan are countries that have left their best years behind them, but they are mistaken. "We don't think we are countries from the past. We should lead the world economy," he said. He said it was "encouraging" that Japan was embarking on a growth strategy under Prime Miniser Shinzo Abe to revive long stagnant growth through a massive monetary easing and fiscal stimulus. During the three-day visit, Japan and France agreed to deepen their cooperation on nuclear technology. Asked about the deal amid national debate in Japan over the future of nuclear energy after the Fukushima disaster, Holland reiterated that as forerunners in nuclear energy technology, the two nations need to cooperate over its safety "so that there is no doubt over its reliability." In response to a question about China, Hollande said that while France does have trade disputes with China — and a yawning trade deficit of 25 billion euros — Paris needs to "work with" Beijing and shouldn't be expected to choose between Japan and China as they were both important regional economic powers. "We have the will to work with Asia, and not to oppose any particular country," he said. "We have a friendly relationship with China for a long time now, and a relationship of exceptional partnership with Japan," he said. "Please do not ask us to choose." Hollande also commented on the trade dispute over solar panels between the European Union and China, saying discussion is ongoing and that the issue will be on the agenda in the upcoming meeting of the European Commission later this month. "We will debate this with the European Commission because it's important that all European countries agree on the decisions made" he said. On Tuesday, the EU announced duties averaging 47 percent on Chinese-made solar panels, cells and wafers but said it would postpone imposing the full tariffs until August to allow time for negotiation.